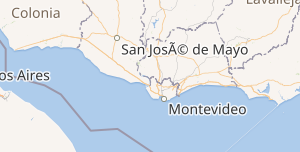 The label appears on zoom 7, and on zoom 8 a "San José" label appears on z8. The current code considers name and name:en when matching. Pnorman added a subscriber: Kocio. This looks like a UTF-8 string is being (mis)interpreted as ISO-8859-1, which commonly happens on the web when the Content-Type HTTP header is missing. For historical reasons, that header defaults to iso-8859-1, even though almost everything is utf-8 now. Another context in which this can happen is database fields, which often have similarly unhelpful encoding defaults. Yes, it's an encoding error, but not one related to HTTP. Looking at the database, this is geonameid=3440639 from ne_places, and displays the same in my terminal, which is set up appropriately for unicode. The name is \x53616e204a6f73c383c2a9206465204d61796f, which, stripping the understandable prefix and suffix, leaves c3 83 c2 a9. Warning 1: One or several characters couldn't be converted correctly from WINDOWS-1252 to UTF-8. AntiCompositeNumber assigned this task to Pnorman.